If you've been wondering what all the buzz is about the mason bee, this is the book for you. What benefits are there to keeping them? What risks and challenges? Can you keep them in the city? 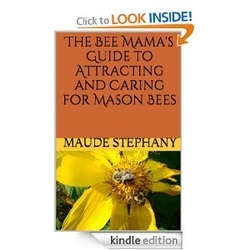 You will learn the answers to these and many other questions about attracting and caring for mason bees in this informative booklet written by the Bee Mama herself, Maude Stephany.